Note: This post was updated on October 4, 2009. My post "Divided Loyalties" inspired an anonymous reader to make available an intriguing souvenir of the Biafran independence struggle. 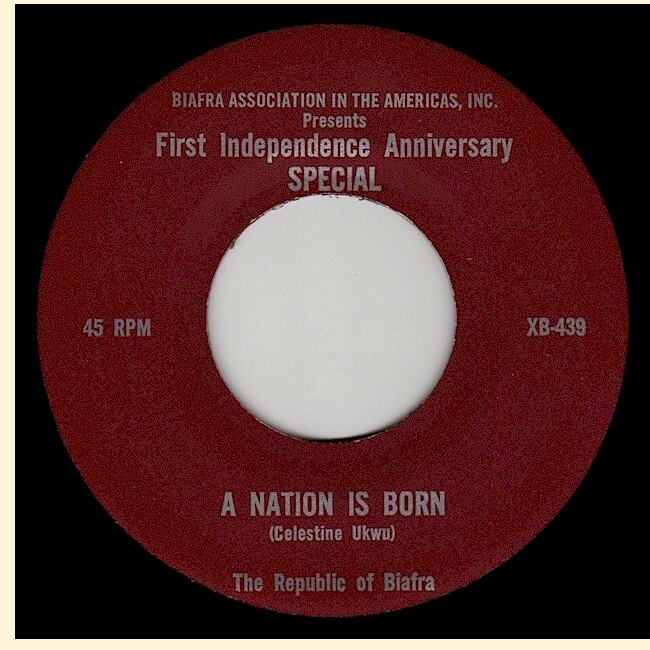 First Independence Anniversary Special, a 45, was issued in 1968 by the Biafra Association in the Americas, Inc. under the reference number XB-439/XB-440. The A side is "A Nation is Born," a previously-unknown-to-me song by highlife master Celestine Ukwu, while the flip side is the song "God Bless Colonel Ojukwu" by Rex Lawson, which I featured in that earlier post under the title "Odumegwu Ojukwu (Hail Biafra)." Anonymous poses an interesting question: While First Independence Anniversary Special was obviously pressed in the United States, were records pressed in Biafra during the war? I do know that music by Ukwu and other musicians was recorded and broadcast on Radio Biafra during the conflict, but I'm not aware of any record-pressing facilities in Biafra at the time. Of course, there is always the possibility that records were pressed abroad and smuggled into the Biafran enclave, a fraught task. Could someone shed some light on this matter for us? 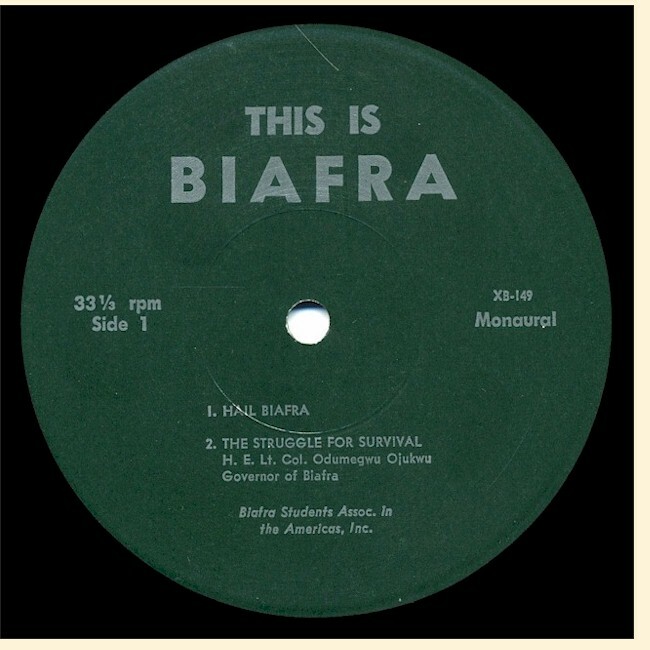 For some time I've been trying to get hold of another record released in the US during the war, Igba na Egwu Ndi Biafra Ji na Anu Agha: Drums and Chants of Fighting Biafra (Afro Request SRLP 5030) by the mysterious "Biafran Freedom Fighters." If anyone out there has a copy, I'm sure we'd all love to hear it. I have an LP which was apparently put out by the same people who issued First Independence Anniversary Special. 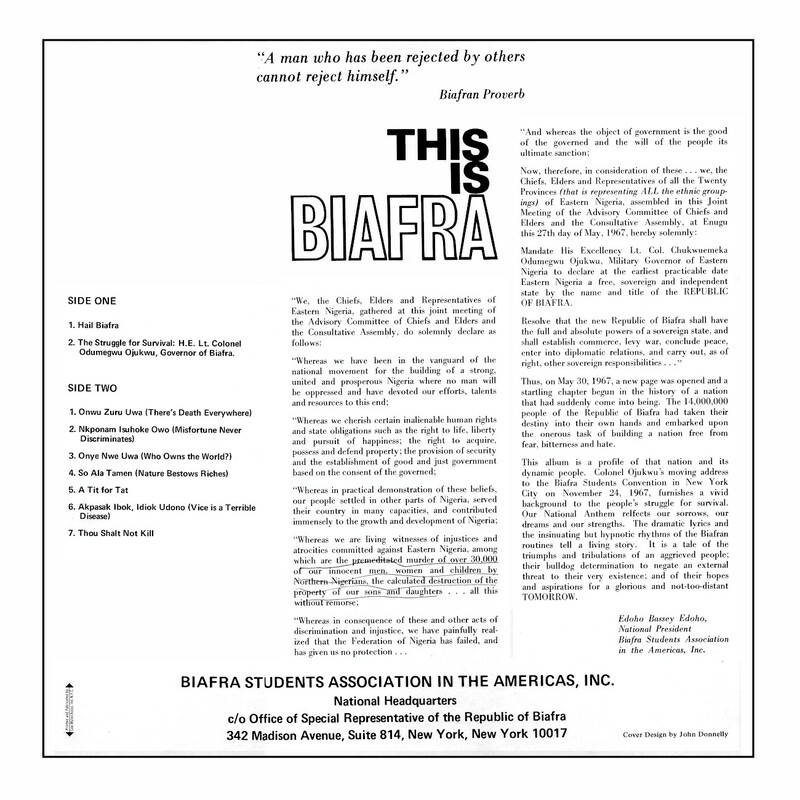 This is Biafra (Biafra Students Association in the Americas XB-149/XB-150) features an instrumental, "Hail Biafra" (the Biafran national anthem?) and a speech by Odumegwu Ojukwu on Side 1, and seven musical selections on Side 2. Unfortunately, while the song titles are given, the artists aren't credited. I've written about the Biafran situation in previous posts, and I would recommend John de St. Jorre's The Nigerian Civil War (Hodder & Stoughton, 1972), long out of print, as an even-handed and detailed account of the conflict. This article from Wikipedia is also useful. I would say at the risk of sparking a controversy that I think the Biafran cause was a noble one, and had it succeeded, would have changed the course of African history in a positive direction. But I'm afraid Biafra's historical moment has come and gone; whatever the future of Africa has in store, an independent Biafran state will probably not be part of it. Download This is Biafra as a zipped file here. ". . . we headed off into the forests to the hut of an infamous 'witch doctor," or shaman, called Area Scatter. His home was filled with bones and skulls and paintings of the power of good and evil. A muscular, humorous man, he explained how, after living through the civil war, he had gone into the wilderness for seven months and seven days and had reappeared transformed into a woman. The day we visited him he headed off, dressed in white smock, polka-dot skirt and a shamanist bone necklace, to the residence of his Royal Highness Eonunnoke to play for the local king and queen. "Area Scatter was a highly accomplished performer on his thumb piano which was decorated with a distinctive skull and crossbones. When the king and his wife ceremonially entered and seated themselves on their thrones, Area Scatter bowed deeply and started to sing in a soft, rich voice. . ."
Of course, in the United States there are well-known transvestite performers like Ru Paul or Divine, but I understand that this sort of thing is rather odd for Nigeria, at least among the Igbo. I'm not aware of any tradition of theatrical cross-dressing in Nigeria (as for instance in Chinese opera or during Shakespearean days), nor should we assume that Area was gay. While homosexuality in Nigeria is certainly not unheard of (a reading of Hints or any of the other Nigerian "True Confessions" - type magazines should dispel that notion! ), it is surrounded by so many layers of scandal and condemnation that the idea that any Nigerian would flaunt his or her gayness is, frankly, mind-boggling. So let's just say that Area Scatter was a guy who literally marched to his or her own drummer, and leave it at that. 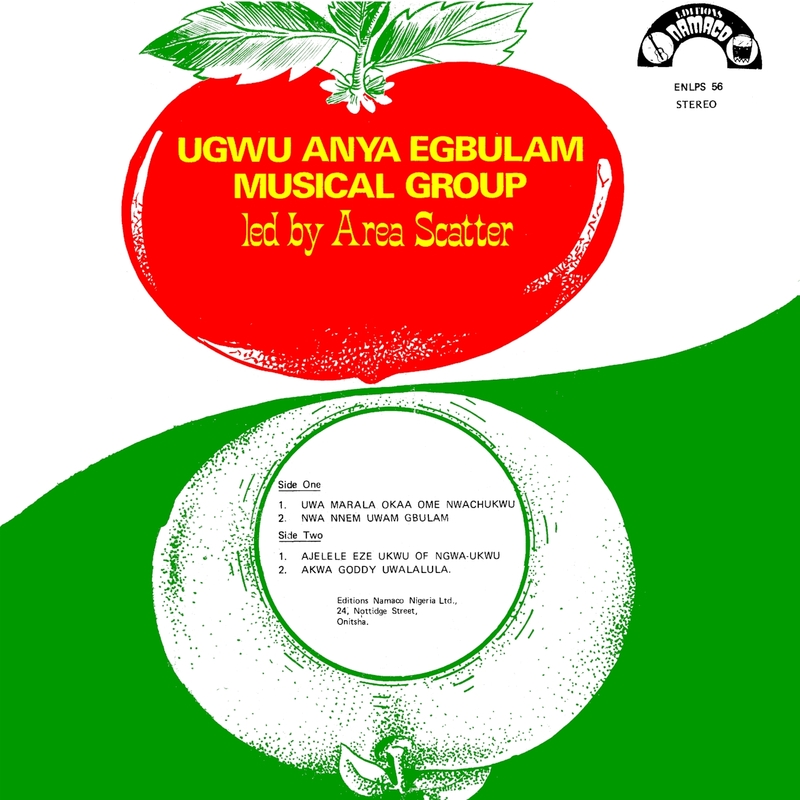 When my wife, Priscilla, returned from Nigeria a few years ago, she brought back an actual Area Scatter LP, Ugwu Anya Egbulam Musical Group led by Area Scatter (Namaco ENLPS 56), excavated from a used-records shop in Ajegunle. 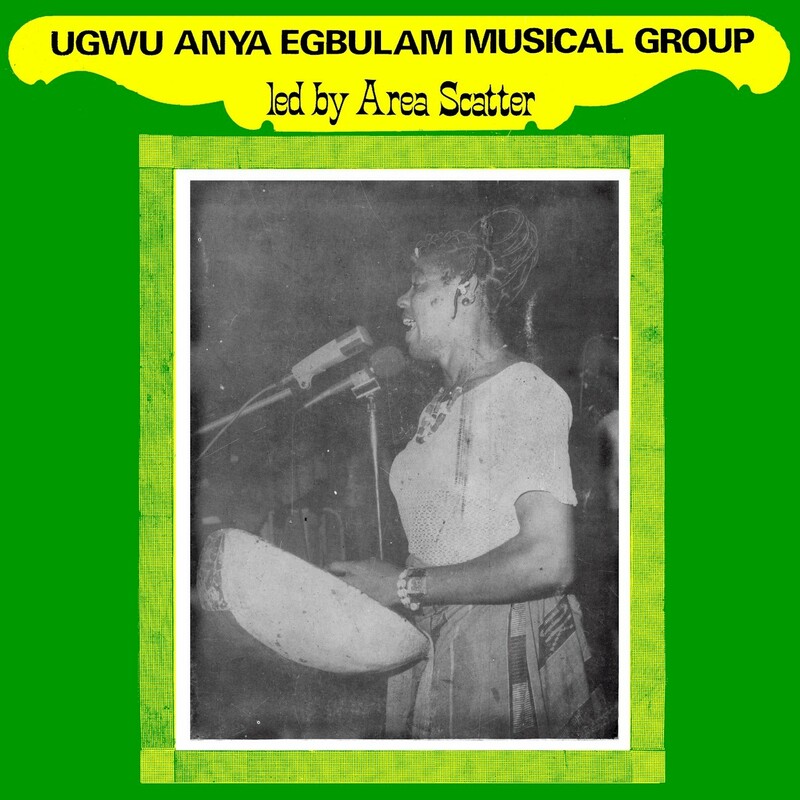 The name of the group, "Ugwu Anya Engbulam" means roughly "The Evil Eye Will Not Kill Me." I was originally going to put up just one track from it, then decided that posting the whole album would give listeners a better feel for the talent of this unique artist, Area Scatter. Many thanks to Priscilla for interpreting the lyrics. Albums of Nigerian traditional music like this are not rare - thousands of recordings of Igbo traditional music alone were issued during the '60s, '70s and '80s. What is unusual is to find any of them outside of Nigeria. To be honest, I just love the stuff, so I will be posting more of it in the future. If you would like to see "Konkombe," or any of the other episodes of Beats of the Heart, you can order the DVD here.